No penséis en algo como la Casio FX-991 SP X, pues esta Kontrolpribor KL-1, es lo que se llama una regla de cálculo circular, vendría a ser más parecida a una de las reglas de cálculo que muchos habréis visto, o incluso usado, en alguna ocasión, pero con un diseño original, que parece un reloj de bolsillo. – Funciones trigonométricas inversas (arcoseno, arcocoseno, arcotangente). – Cálculo del área del círculo. La KL-1, se produjo al menos en 3 factorías, comenzando en 1966, siendo la principal, la que yo poseo: Kontrolpribor (Контрольприбор), es decir, la Fábrica de Instrumentos Experimentales de Control de Moscú. 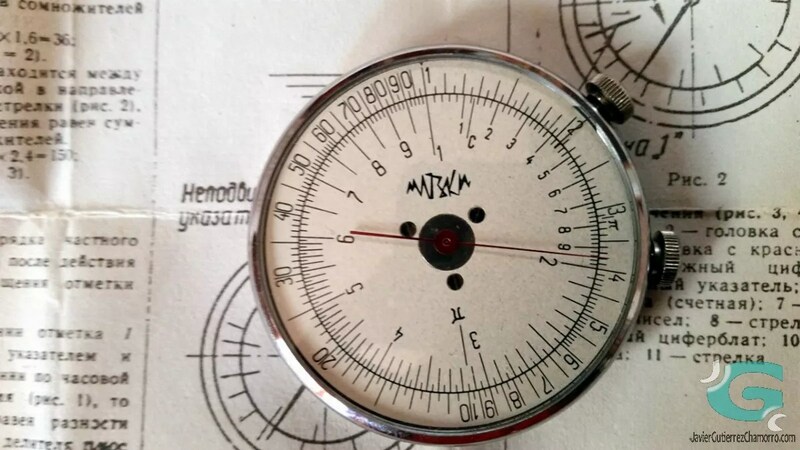 Su diámetro es de 50mm, es decir, similar al de un reloj de bolsillo o un cronógrafo de mano. Suficiente para poderlo transportar con comodidad, pero algo escaso para ver cómodamente sus escalas… Dichosa presbicia. En cualquier caso, nunca va mal acompañarlo de una lupa. Está fabricada en 1969, y en un estado completamente nuevo y sin usar, que podía conseguir en eBay, por unos 50€. Incluye su cajita original de cartón, en unas condiciones algo justas, y el manual de instrucciones en ruso, en un estado de conservación increíble. Está construida en metal, y el cristal es de plexiglass. En Youtube, encontraréis un interesante video, explicando su funcionamiento. Os dejo para descargar una adaptación de las instrucciones originales: manual de instrucciones en inglés (120 Kb. en formato PDF), y a continuación, os las pongo sin adaptar, como traducción del manual original en ruso. 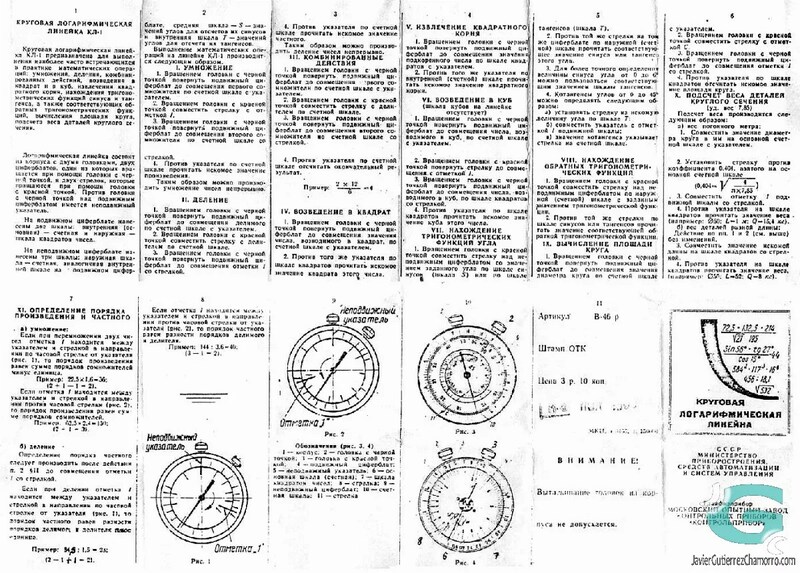 The circular slide-rule КЛ-1 is designed to perform common mathematical operations such as multiplication, division, combined operations, squares, cubes, square-root and cube-root extractions, trigonometric functions of sine and tangent as well as inverse trigonometric functions, calculations of circle area and weight of right circular cylinders. 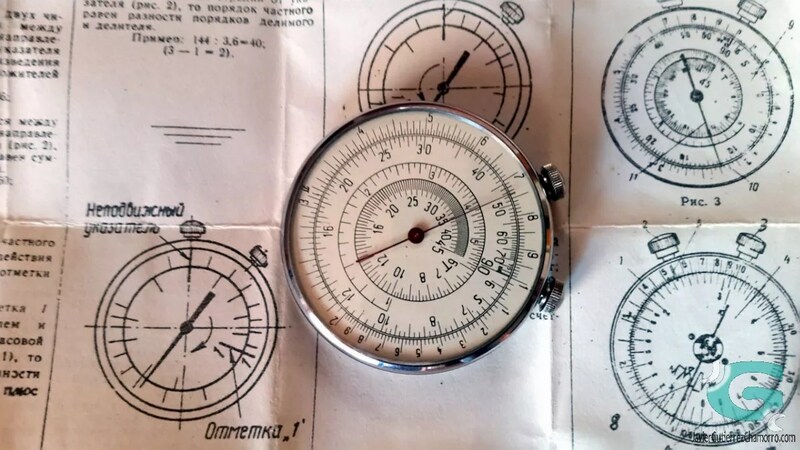 The circular slide-rule comprises a shell with two knobs, two index plates, one of which rotates with help of a black-dotted knob, and two pointers rotating with help of a red-dotted knob. A fixed indicator is located on the same side as the rotating index plate, adjacent to the black-dotted knob. Two scales – an inner (basic) scale for calculation and an outer scale for squares – are displayed on the rotating index plate. A central scale S of angles for calculating sines and an inner scale T of angles for calculating tangents. Using the black-dotted knob, turn the rotating index plate to set the first multiplier on the calculation scale coincident with the fixed indicator. Using the red-dotted knob, set the pointer coincident with the index of the calculation scale. Using the black-dotted knob, turn the index plate to set the second multiplier on the calculation scale coincident with the pointer. Read the desired value of the product opposite the fixed indicator on the calculation scale. Numbers can be multiplied continuously. Using the black-dotted knob, turn the rotating index plate to set the dividend on the calculation scale under the fixed indicator. Using the red-dotted knob, set the pointer coincident with the denominator on the calculation scale. Using the black-dotted knob, turn the rotating index plate to set the index of the calculation scale coincident with the pointer. Read the desired value of the quotient on the calculation scale opposite the fixed indicator. You can divide numbers continuously in this way. Using the black-dotted knob, turn the index plate to set the first multiplier coincident with the fixed indicator on the calculation scale. Using the black-dotted knob, turn the rotating index plate to set the second multiplier coincident with the pointer on the calculation scale. Read the final result opposite the fixed indicator on the calculation scale. Using the black-dotted knob, turn the rotating index plate to set the value of the number to be squared on the calculation scale coincident with the fixed indicator. Read the desired value of the square of the number opposite the same indicator on the scale of squares. Using the black-dotted knob, turn the rotating index plate until the value of the number on the scale of squares is coincident with the fixed indicator. Opposite the same indicator on the inner (calculation) scale read the desired value of the square root. Using the black-dotted knob, turn the rotating index plate until the number to be cubed is coincident with the fixed indicator. Using the red-dotted knob, turn the pointer to set it coincident with the index of the calculation scale. With the black-dotted knob, turn the rotating index plate until the number to be cubed on the scale of squares is coincident with the pointer. Read the desired cube of this number on the scale of squares. With the red-dotted knob, set the pointer on the fixed index plate coincident with the value of the desired angle on the sine scale (scale S) or on the tangent scale (scale T). Read the relevant value of sine or tangent of this angle opposite the pointer on the fixed index plate on the outer (calculation) scale. For obtaining values of the sine of angles ranging between 0 and 6 degrees, use the corresponding value of the tangent scale. a) Set the pointer to the desired value of the angle on scale T.
c) The pointer on the calculation scale will indicate the cotangent. With the red-dotted knob, set the pointer coincident with the value of the trigonometric function on the outer (calculation) scale of the fixed index plate. Read the corresponding angle on the sine or tangent scale opposite the pointer. 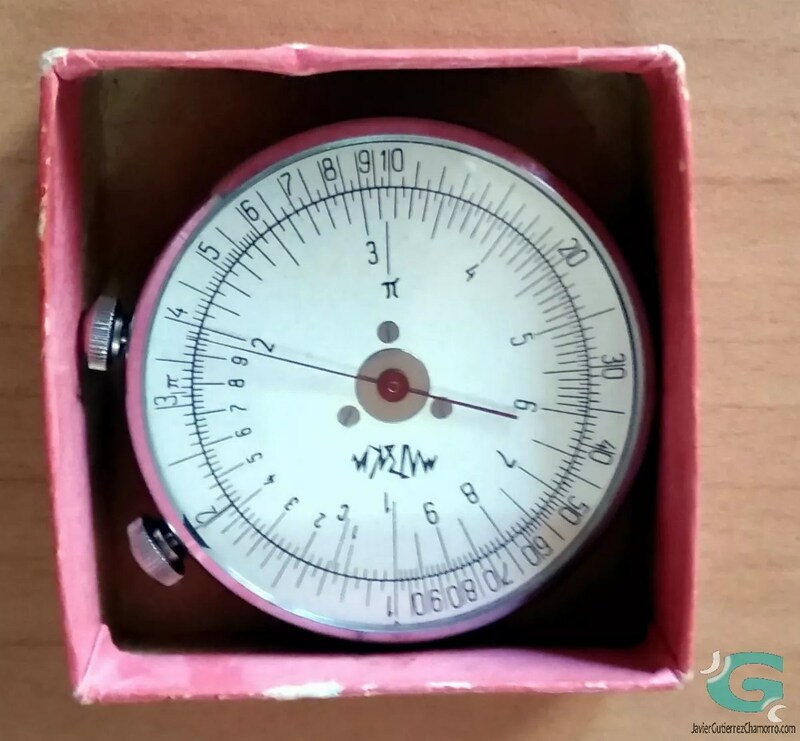 With the black-dotted knob, turn the rotating index plate to set the value of the diameter of the circle on the calculation scale. Using the red-dotted knob, set the pointer coincident with the gauge point C (= sqrt(4/pi) = 1.128). Read the desired value of the area of the circle opposite the fixed indicator on the scale of squares. Read the value of the weight (example D = 50mm; L = 1 m; W = 15.4 kg) opposite the pointer on the scale of squares. Read the value of weight (example D = 50mm; L = 0.52 m; W = 8 kg) opposite the pointer on the scale of squares. If in multiplying two numbers the index of the calculation scale is positioned between the fixed indicator and the pointer clockwise from the indicator (Fig. 1), the order of multiplication shall be equal to the sum of orders of the multipliers minus 1. (2 + 1 – 1 = 2). If the index of the calculation scale is positioned between the fixed indicator and the pointer counter-clockwise (Fig. 2), then the order of the product shall be equal to the sum of orders of multipliers. Order of coefficient is to be defined following actions described for step 2, section II, prior to setting index of the calculation scale coincident with the pointer. If in the course of division the index of the calculation scale is positioned between the fixed indicator and the pointer in the clockwise direction from the indicator (Fig. 1), then the order of coefficient shall be equal to the difference of the order of the dividend and denominator plus one. If the index of the calculation scale is positioned between the fixed indicator and the pointer in the counter-clockwise direction from the indicator (Fig. 2), then the order of the quotient is equal to the difference of the orders of dividend and the denominator. Esta entrada se publicó el 4 de mayo de 2017, 10:29 y está guardada en Ciencia, Relojes. Puedes seguir las respuestas a esta entrada en RSS 2.0. Puede ir hasta abajo y dejar una respuesta. No se permiten pings. Que bonita es, Guti. Lo de raíz cuadrada me ha dejado perplejo, es la primera vez que veo algo así, no sabía que existieran, de hecho me parece mucho más útil y práctica que las reglas de cálculo convencionales. 50 € creo que es un precio algo alto, pero si la calidad de construcción es buena (tratándose de rusa, no lo dudo) entonces está bastante bien. Por otro lado me alegro porque hayas encontrado algo como lo que tanto estabas buscando: cálculo mecánico, compacto, y que no ocupase espacio 😀 Y además con diseño de reloj, vamos, que lo tiene todo. No habría podido caer en mejores manos este artilugio. Y la verdad es que es precioso. Muchas gracias BiaNamaran. Precisamente la raíz cuadrada, es lo que también me llamó la atención. Aunque si lo piensas, del mismo modo que hay tablas de expoenciales, hay tablas de raíces cuadradas, aunque no deja de sorprenden lo ingenioso, y a la vez simple, que es el funcionamiento. El precio es caro, es evidente, y lo que pagamos no es tanto el producto, sino el hecho de ser un artículo NOS, que alguien ha tenido que conservar desde hace casi 50 años. Vamos, pagamos el almacenaje. La calidad de construcción parece buena, y hecha para durar, como casi todo lo soviético, sin refinamientos, que es lo que hacía que fuera relativamente asequible en su época. Sí, tienes razón, buena parte del precio es pagar por haberlo “rescatado” del pasado. Es una pena que ya no se hagan cosas así, aunque visto lo visto, de hacerse llegarían de China y a las pocas semanas de uso la ruleta iría por un lado y la aguja por el otro… 😛 Casi mejor así porque al menos queda el recuerdo de la buena construcción y atractiva funcionalidad de este tipo de instrumentos. Así es. Si ha de ser chino, para eso mejor que no lo sea. Es lo que comentábamos con las zapatillas deportivas. Cuando tu actividad diaria, depende de una herramienta en concreto, no te la puedes jugar. Necesitas algo fiable, duradero, y que no te deje tirado. Eso es lo que hacían los soviéticos, los alemanes, los americanos, y todos los países que tenían una industria fuerte. Hoy en día, ni siquiera las cosas importantes se hacen para durar, y con algo que sólo usarían los frikis como nosotros puntualmente, aún menos. Pero admiro aquel tesón en adelantarse a los posibles fallos, y en hacerlo lo más confiable posible. Un poco lo mismo que G-Shock en sus inicios. Intentar preveer los posibles fallos, y cubrirlos a nivel de diseño o construcción antes de que se produjeran. También hay otros elementos que siguen como yo los conocí de niño: lápiz staedtler (el nº2), goma de borrar milan… pero al ser material fungible no es lo mismo. Me imagino que ese es el motivo por el cariño que tenemos muchos de nosotros a los objetos de papelería. Por cierto que si en su día no lo leíste, te recomiendo Papelería técnica. Tanto los lapiceros de Staedtler, como las gomas de borrar de Milán, siguen siendo exactamente igual que eran, productos asequibles, y de buena calidad. Sin embargo, son mercados que van a menos, los adultos, apenas escriben a mano ya, y veo a muchos niños, que ya utilizan artículos chinos low-cost. Probablemente Staedtler siga durante muchos años, pero a Milán, los veo demasiado diversificados. Además de las genuinas gomas de borrar, ¡fabrican hasta calculadoras! Bueno, en realidad debería decir que las remarcan. Muchísimas gracias por tu comentario Marius. Desgraciadamente la durabilidad es un bien escaso en nuestros días, así que los que defendemos esa filosofía, como tu y como yo, nos vemos obligado a recurrir a artículos del pasado. Esos que nos llenan, y que podremos disfrutar muchos años.